letter-spacing : Letter spacing is spacing define between each letters. length(pixel, point, em) or normal. 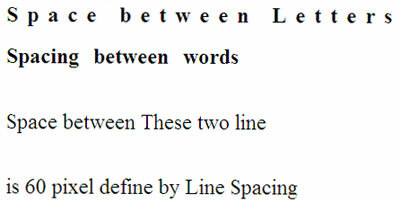 line-height: Line is height is spacing between two lines, such as a paragraph, without adjusting the size of the font. It can be a number (which specifies a multiple of the font size, so '2' will be two times the font size, for example), a length, a percentage or normal.